FIRE MAUL - MOOSE SAFETY SUPPLY, INC. 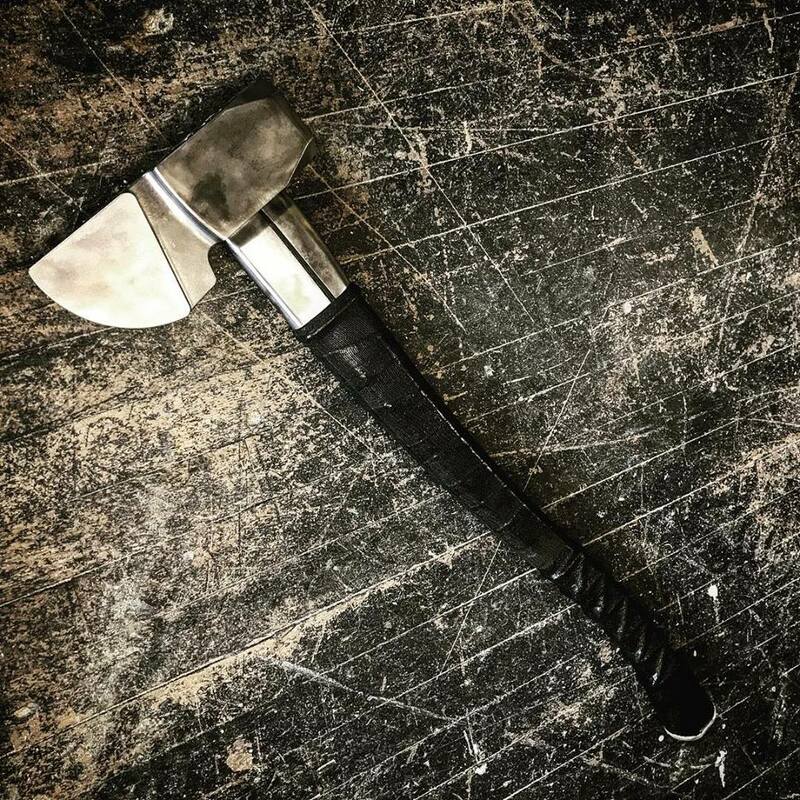 The new Fire Mauler is a smaller, more compact design that has been updated with more features to help force entry, ventilation, and other tasks performed by the original Fire Maul. Also updated marrying capabilities with your halligans to create better purchase points or better leverage if needed. The head of the Fire Mauler has been resurfaced so you now have 4 striking surfaces, rear both sides, and top, depending on space or force needed. 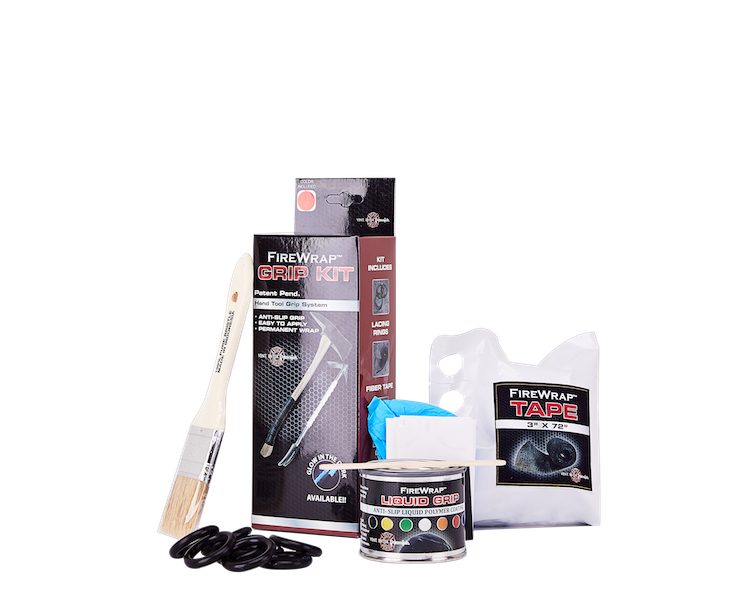 The Fire Reaper has similar capabilities but offers a pike end for creating purchase points. Finally the fire service has a maul designed specifically for our job! Open roofs easier. Force doors faster. Smash your way in or out! Made in the USA! Each tool is hand assembled, individually inspected and tuned for the perfect balance. We hone each blade to meet both an ideal sharpness and provide a single contact point for cutting. We apply each FireWrap® grip by hand, perfecting each grip. All part of our Pat Pend. FireWrap® Grip system. We finally finish with a special blend of oil rubbed into each handle sealing and protecting it for years to come. Each Fire Maul® becomes a direct representation of who we are as a company, fueled by quality, pride, and tradition! ST - Steel Collar Shield - 1 lb. Total Head Weight: 10.3 lbs. MAKE IT YOURS! ADD CUSTOM ENGRAVING TO YOUR HANDLE FOR THE PERFECT WALK-AWAY INSURANCE. THIS IS YOUR TOOL, THERE ARE NOT MANY LIKE IT AND THIS ONE IS YOURS! WE CAN ENGRAVE A VARIETY OF FONTS AND SIMPLE LOGOS APX 1/8" INTO HANDLE FOR AN ENGRAVING THAT WON'T WEAR OFF. ADD A PREMIUM RESIN POUR OPTION FOR JUST FONT, LOGO, OR FONT WITH LOGO. RESIN POURS ARE A THREE DAY PROCESS OF ARTWORK SETUP, ENGRAVING, HAND INJECTING RESIN, SANDING AND FINISHING HANDLE. GRAPHICS SHOULD BE IN VECTOR FORMAT (PDF, EPS, OR AI). LOGOS SHOULD BE SIMPLE AND FONT CHOICES SHOULD NOT HAVE FINE LINES OR POINTS. WE WILL CONTACT YOU VIA EMAIL TO COORDINATE LAYOUT AND DESIGN OF REQUESTED ENGRAVING ALONG AND WHERE TO SEND ARTWORK FILE. YOU WILL BE PROVIDED A PROOF THAT NEEDS TO BE APPROVED BEFORE WE CAN START YOUR HANDLE. NO REFUNDS OR CHANGES ON APPROVED PROOFS/HANDLES. RESIN COLORS AVAILABLE: RED, BLACK, YELLOW, GREEN, BLUE, GLOW-AQUA, GLOW-GREEN. 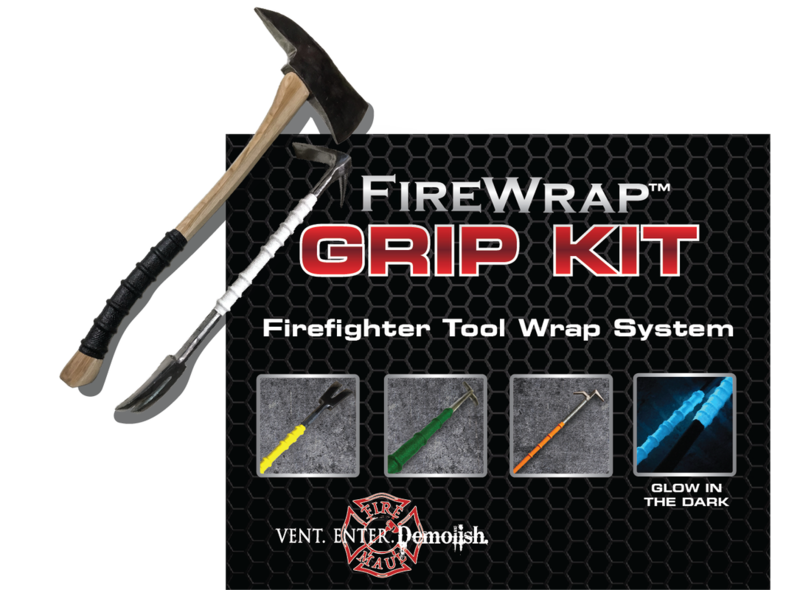 Introducing our ALL NEW FireWrap® Grip Kit by Fire Maul Tools. Bring home our newest Pat. Pend. grip system for your own tools! The only made for Firefighter grip kit with permanent fiber tape and custom lacing ring system. Finished wraps include our Liquid Grip with extra grit finish. Available in a variety of colors, including our FireWrap® GLOW option. Finally an easy to install, true permanent grip system engineered for all firefighter hand tools! Game Changer! 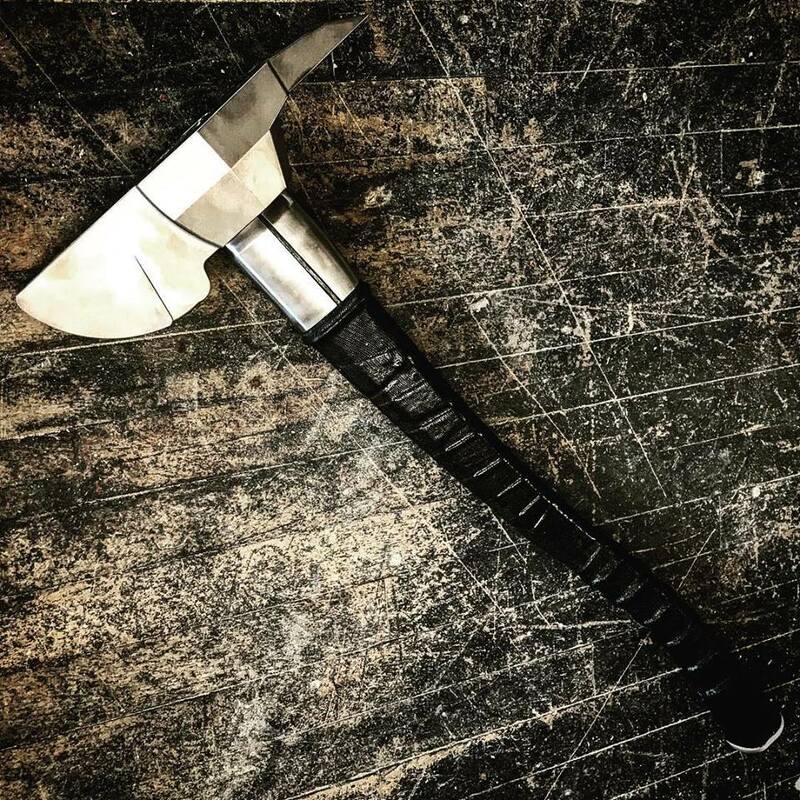 This Kit includes everything you need to complete 8 - 12” of grip on axes and striking tools. 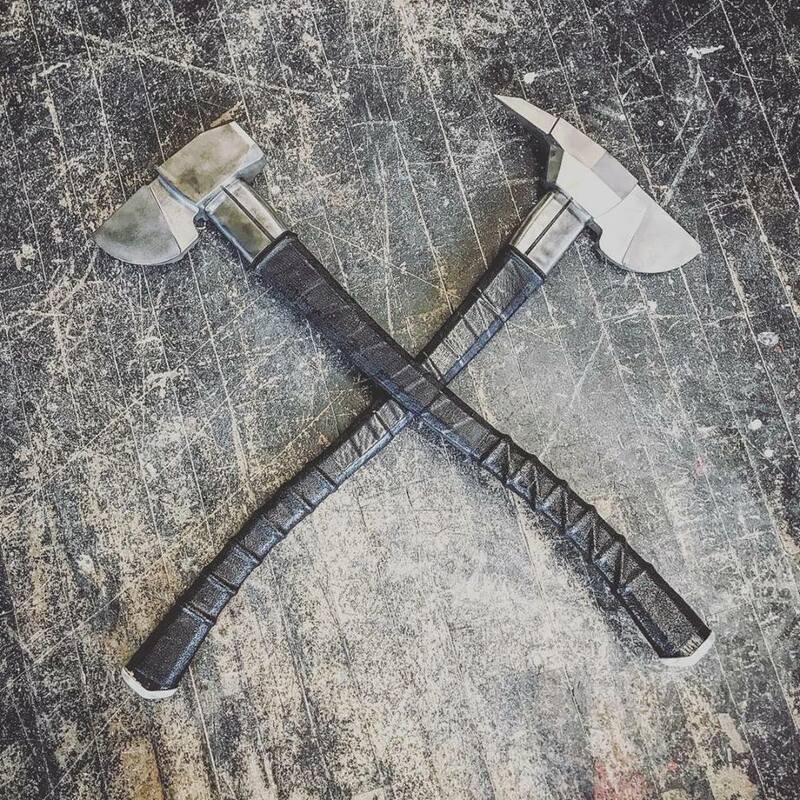 NY Hooks and Halligan Bars may receive up to 24” of grip. You can grip up to two tools with one kit. FLAG PACK - EXTRA LIQUID GRIP IN YOUR CHOICE OF 3 STANDARD COLORS. EXTRA PAINT BRUSH AND VINYL STRIP.